My book, "The Politics of the Rope: The Campaign to Abolish Capital Punishment in Britain, 1955-1969", has been published by Arena Books of Bury St Edmunds last year, 2012, price £18.99. It is a deeply researched academic study of the campaign to abolish hanging in Britain, based very largely on my extensive and intensive researches for my PhD of the same name. Details to follow. It is obtainable online from Amazon, or from Arena or from myself. 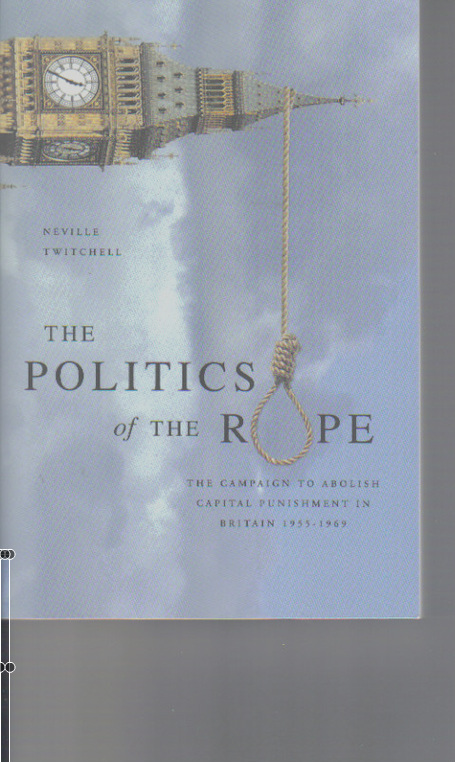 My book The Politics of the Rope: The Campaign to Abolish Capital Punishment in Britain, 1955-69 has just been published (Arena, softback, 400 pp., October 2012, £18.99). It is essentially the long version of my PhD thesis of the same title, which I have been trying to get published for a long time. It is a work of political history, being an account of the campaign to abolish hanging in this country, focusing more or less completely on the critical years from the mid 1950s to the late 1960s. It deals with the campaign from a very broad perspective, taking in the Parliamentary manoeuvring and pressure group activity, but covering also social, religious and cultural factors, and setting it in the context of the liberalising mood of the times and the raft of conscience legislation on abortion, divorce and homosexuality . It seeks to demonstrate the way in which social and cultural trends can flow into and out of politics. It is based chiefly on primary sources, including much material hitherto largely overlooked, including the papers of the main abolitionist pressure group, much Home Office documentation drawn from the National Archives, and the papers of the chief political parties. It includes a discussion of the treatment of the hanging issue by the mass media, especially television, radio, film and theatre, and its coverage by the press, both popular and specialist; and draws, inter alia, on the written archives of the BBC; and demonstrates the way in which the question was woven into the fabric of popular culture. There is an analysis of the activities of the various professional bodies representing the police, the prison service and the legal profession and how important they were in influencing the course of political debate, and there is a lengthy discusion of the role of the various churches and how their position evolved during the course of the fifties and sixties. 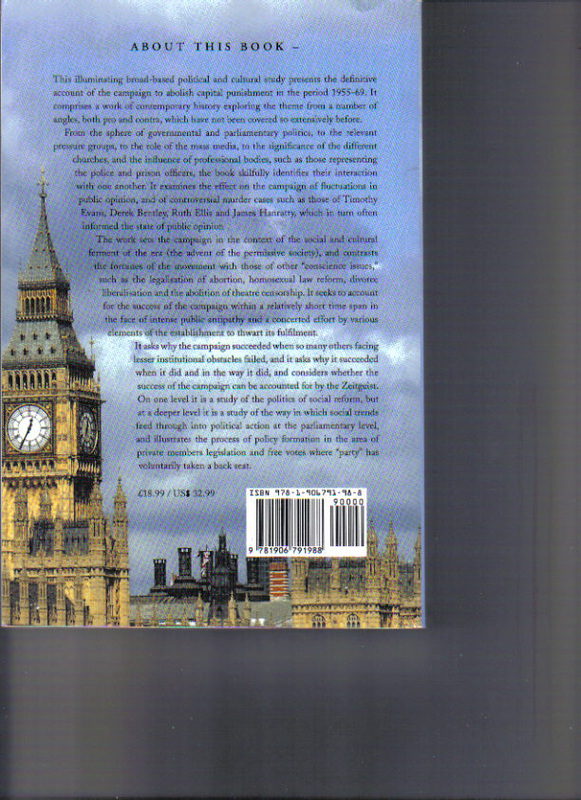 There is a chapter on opinion polls and the importance, or unimportance, of public opinion, and there is an analysis of the significance of the various miscarriages and causes celebre of the era, particularly the cases of Timothy Evans, Derek Bentley and Ruth Ellis and to what extent they weighed on public opinion. Later chapters deal with the governmental manoeuvring over the entrenchment of abolition and the attempts to beat off a strong campaign to restore hanging at the earliest opportunity in the wake of a number of high profile murder cases, attributed, rightly or wrongly, to the abolition of hanging; the tangentially associated campaigns about other "conscience" issues such as the legalisation of homosexuality, the liberalising of divorce and abortion, the abolition of theatre censorship and the relaxation of the Sunday Observance laws. There is an analysis of the reasons for the ultimate success of the campaign despite consistently adverse public opinion and in the teeth of institutional hostility from the judiciary, much of the Conservative Party, the police and prison service and much of the right-wing press. The book is available on Amazon and from most major booksellers.